The lifestyle design archives in Takis Athanassiou Blog. Here there are all the related posts and articles in this category. The fact that many people find it hard to cover all their bills and expenses at home nowadays shouldn’t come as a shock. Often, working a full-time job isn’t even enough, and a supplemental income is also necessary, such as a part-time job. So, when you do make that jump to start your own business, it’s a risky move, not just from a business standpoint but from a personal finance standpoint too. 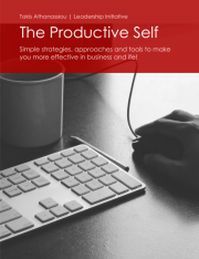 Productivity is one of the holy grails of personal and professional life for many of us. Anyone who is remotely driven, or ambitious, wants to ensure that their time is spent as wisely and effectively as possible, and yields the greatest possible return, in terms of moving them closer towards achieving their goals. This article has been written by Artem Klimkin. Artem is a certified functional movement specialist. On his blog loves to educate people on how to stay healthy and productive in the office. Everyone who has ever been employed has secretly wished to enter the circle of freelancers – the lucky people, who allegedly travel 24/7 around the world and manage to get their work done using only a laptop/phone in between sipping cappuccinos in Rome and climbing the Eifel tower in Paris.